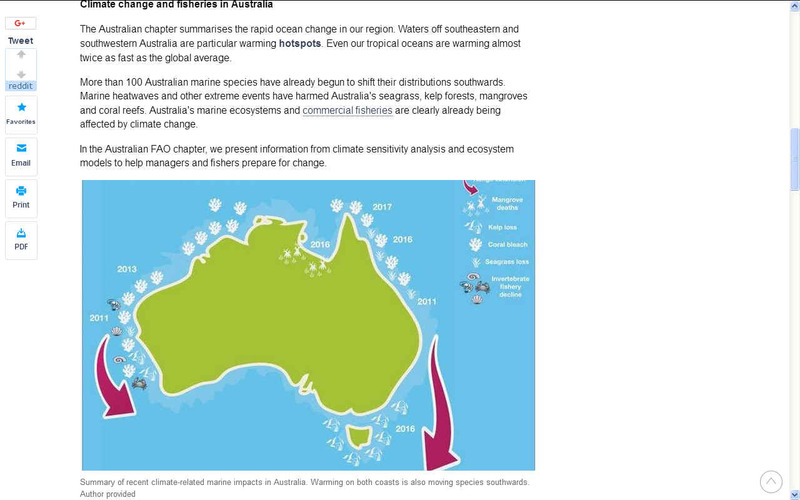 AUSTRALIA - Summary of recent climate-related marine impacts in Australia. Warming on both coasts is also moving species southwards. Numerous studies have highlighted that climate change impacts will put vulnerable marine species at risk of local and even global extinction; however, local actions through effective fisheries management can reduce the probability of those species' extinction risk by as much as 63 per cent, says a new UBC study. Researchers looked at 825 exploited marine fish species across the global ocean, and analyzed their extinction risks due to climate change and fishing impacts. They calculated a conservation risk index for these species based on the ocean changes that they are, and will be, exposed to, their biological sensitivity to climate change, and potential ability to adapt. Their results showed that 499 of the assessed species are projected to experience very high risk from both overfishing and climate change under a 'business-as-usual' scenario, by 2050. They found that this risk level is equivalent to having at least one fifth of these species listed as vulnerable or endangered under the International Union for Conservation of Nature (IUCN) Red List of Endangered Species. "Effective fisheries management plans, coupled with actions to limit greenhouse gas emissions, both separately, but especially in tandem, would have an immediate effect on the number of marine species that face extinction," said William Cheung, lead author and Associate Professor in the Institute for the Oceans and Fisheries at the University of British Columbia. "We can save hundreds of fish stocks from becoming endangered species with sustainable fisheries and low greenhouse gas emissions." 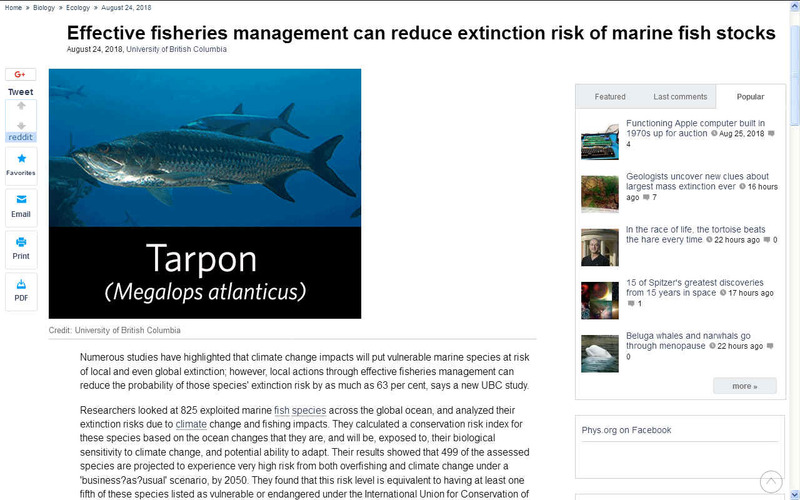 Sharks and rays have the highest extinction risk under 'business as usual' fishing and climate change scenarios. The Dusky smoothhound shark (Mustelus canis) is expected to be the hardest hit, with other species at high risk including Dungat grouper (Epinephelus goreensis), Tarpon (Megalops atlanticus), and Law croaker (Pseudotolithus senegallus). Many of these species are already considered endangered for non-climatic reasons, such as overfishing. This study indicated that the estimated combination of climate and fishing risks means that they are even more likely to become extinct. The areas with more at-risk species due to climate change are in the tropical and subtropical oceans, while those species at risk due to fishing are distributed more broadly, with higher concentration in the North Atlantic and South Pacific Ocean. "Our study showed the need to support adaptation to climate change, while insuring effective fisheries management in these regions," said Gabriel Reygondeau, a postdoctoral fellow at UBC's Institute for the Oceans and Fisheries and co-author on the paper. "Some actions are already underway; for example, nine nations and the European Union agreed to prohibit commercial fishing in the central Arctic Ocean for at least 16 years starting in 2017. Similar proactive planning for the potential interactions between climate change and fishing is needed." The report describes many examples of climate-related change. For instance, the northern movement of European mackerel into Icelandic waters has led to conflict with more southerly fishing states, and apparently contributed to Iceland's exit from negotiations over its prospective European Union membership. reefs. Australia's marine ecosystems and commercial fisheries are clearly already being affected by climate change. A range of ecosystem models have also been used to explore how future climate change will impact Australia's fisheries over the next 40 years. While results varied around Australia, a common projection was that ecosystem production will become more variable. Our ecosystem models indicate that sustainable fisheries are possible, if we're prepared to make some changes. This finding builds on Australia's strong record in fisheries management, supported by robust science, which positions it well to cope with the impacts of climate change. Fortunately, less than 15% of Australia's assessed fisheries are overfished, with an improving trend. * Management plans need to prioritise the most sensitive species and fisheries, and take the easiest actions first, such as changing the timing or location of operations to match changing conditions. * As ecosystem changes span state and national boundaries, greater coordination is needed across all Australian jurisdictions, and between all the users of the marine environment. For example, policy must be developed to deal with fixed fishing zones when species distribution changes. * Fisheries policy, management and assessment methods need to prepare for both long-term changes and extreme events. Australian fisheries have already shifted to more conservative targets which have provided for increased ecological resilience. Additional quota changes may be needed if stock productivity changes. * In areas where climate is changing rapidly, agile management responses will be required so that action can be taken quickly and adjusted when new information becomes available. * Ultimately, we may need to target new species. This means that Australians will have to adapt to buying (and cooking) new types of fish. PHYSICS.ORG JULY 2018 - Fisheries management could reduce the risk of extinction of some fish species. OCEAN CONDITIONER - The fishing industry stands to benefit the most from ocean conditioning and healthier oceans. SeaVax is designed to operate in fleets to target sea-borne waste before it settles on the ocean floor where nobody can recover it. There is nothing like it in existence today, though thankfully, other ideas for trapping plastic waste are being developed in tandem, such as that of Boyan Slat and the Seabin.